Charlie showing no signs of life, but the smells are definitely there; I just knew that buying that canned dog food would backfire on me, so to speak. Yesterday we spotted a sign on the edge of the road; a monastery? Who visits monasteries? Turns out that we do, and I’m do glad we did. I would give ten thousand dollars for a picture of the middle aged nun leaping and frolicking with two dogs, her habit flapping in the desert wind, but as it turns out I don’t have to, as I’ll carry that one in my heart until the say I die. as slobbery as this end is, it’s still preferable to the out put of the other. Roscoe the Monastery dog had a HUGE time with Charlie, and the nuns didn’t seem to care, the two dogs tearing around like complete maniacs. 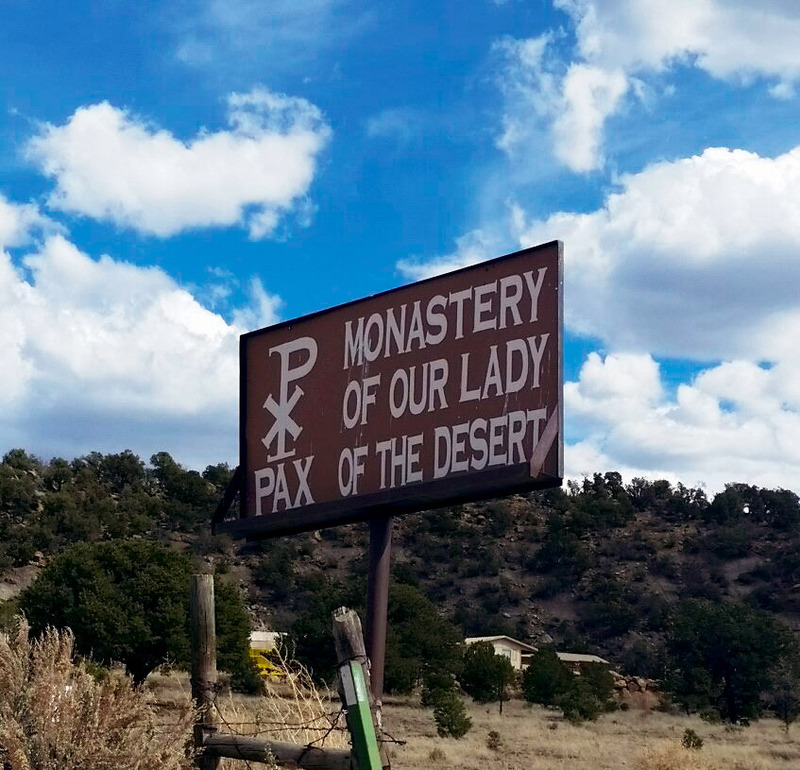 Mother Benedicta invited us to stay the night in their guest house, but we were making time for the Four Corners area, so we had to regretfully decline. I have been raised to shy away from anything that is remotely Catholic, but I am now seeing the error of my ways; how many Protestant cloisters can you show up at unannounced, with a goofy dog in attendance, and be automatically offered a place to stay and expect no payment? There is inherent good in everyone, but sometimes it takes searching for it through an lens untarnished by past prejudices; I wish Mother Benedicta and her sisters health and long life out there in the middle of the desert. As a Catholic I’ll tell you a lil’ secret: it’s not the faith you practice but your actions that speak volumes about the kind of human being you are. Some of the very best people I’ve met are not even religious. My point exactly; people learn little by what you say, more from what you do, most by how you make them feel. Peace. In today’s unfortunate climate, I know I’m guilty of not singing enough praises of all the good there really is among us. Blessings right in front of us! Pax, indeed. Now I, too, have a video in my head of that lovely scene. So thankful for your wonderful descriptive narrative and the ridealong it provides. Yes, sometimes we’re lucky enough to learn beyond what we were taught or what we assumed to be true. It’s a perception gap, i.e. “It doesn’t matter what what is actually happening, it only matters what I preceive to be happening”. Yeah, some folks actually suffer from that. Me too….sometimes.